A family of (almost) four gives me their road-tested tips and takeaways for traveling with a kiddo in tow—and one on the way—through France and Switzerland. The Levi family in the Luxembourg Gardens in Paris. They hired a photographer—for a great price—through Airbnb's Experiences programming. Mexico and Japan, Thailand and Australia, Canada and the UK. These are just some of the stamps you’ll find in three-year-old Lian’s passport. It's fair to say Lian won the parent lottery: Galeet and her husband Alon, travel lovers before they had a baby, made a commitment to stick to it with their daughter in tow. Have they had challenges traveling with a youngster? Of course. Still, the Levis have some serious tricks up their sleeves. Thanks to a trip planning checklist that includes renting baby gear on the road and booking hotels with babysitter services, the family packs light, stays flexible, and builds an itinerary that’s kid and parent friendly. Think playground pit stops and Parisian markets, hikes up Mount Rigi and Michelin-starred restaurants. 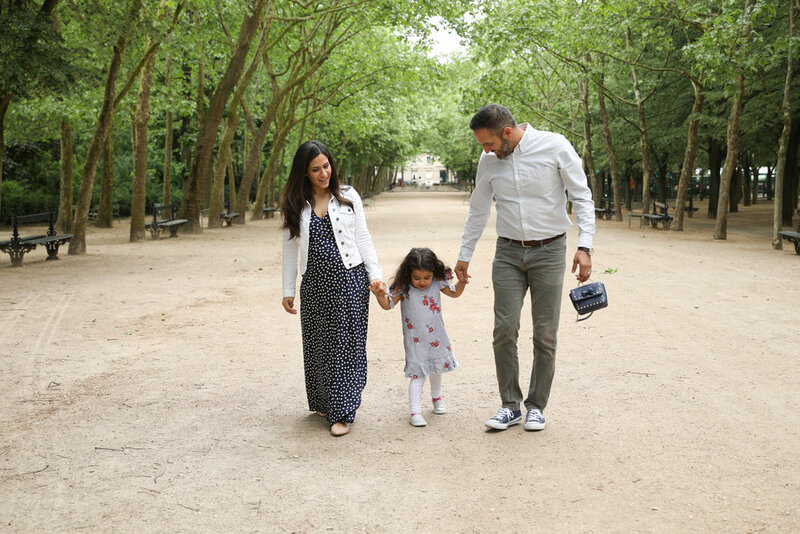 Traveling with a three-year-old is one thing, but on this latest trip to France and Switzerland, Galeet was also five-months pregnant, putting the family’s plans—and patience—to a new test. Read on for her savvy intel. Strolling through the Luxembourg Gardens in Paris. Pack selectively: While we had enough diapers and wipes to get through the first few days, we purchased the rest once we arrived in France. Buying on the road allowed us to travel light. We also rented car seats, so the only gear we brought was our stroller, the BabyZen Yoyo. It’s lightweight, fits in overhead compartment (no gate check! ), reclines for naps, and it handles various terrain really well. We also brought freezer and sandwich sized bags and used them daily for snacks, keeping clothes organized between hotels, and for the occasional pee accident. Focus on in-flight comfort: I opted for isle seats on our flights to Europe so I could get up and walk around. On our return trip, we snagged business class seats with United’s MileagePlus Saver Awards, which was incredibly helpful being pregnant. Think ahead about entertainment: Now that Lian is three, we prepare for flights with shows and plenty of snacks. We loaded up our iPad with her favorite programs and downloaded a few new ones from Netflix, “Llama Llama” and “Word Party.” They were a huge hit! Get over jet lag: Getting our daughter on Europe time quickly was key. The first few days, we leveraged black out curtains, woke her up in the morning, made sure she ate at normal times, and honored nap time, even if it meant she slept in the stroller. Slow down your schedule: Pre-kids, we jumped around from one location to the next. Now we pick fewer locations and linger longer. Moving around less helps us enjoy each day without having to pack in too much. You will inevitably have good days and bad, and keeping things flexible allows you to decide what is too ambitious on an off day. The Babyzen Yoyo—and a napping Lian—takes on Mount Rigi in Switzerland. Have screen-free distractions: We’re big fans of Melissa and Doug's “Water Wow!” activity books. They make great for great car and restaurant entertainment, a perfect fit for our itinerary, which included driving and dining in Provence. Spend time choosing hotels: Location and comfort were the biggest deciding factors in our accommodations, especially since I was pregnant, and I always asked for extra pillows to build my own maternity pillow. Even when traveling with Lian, we opt for smaller boutique hotels and B&Bs that strike a good balance between parent and kid-friendly features. In Lucerne, for example, we decided on Beau Sejour. It happened to be a new boutique hotel, but more importantly, it had a playground across the street. Here, Lian played with local children, and she was noticeably well behaved on the days we let her run around the park first thing in the morning. Don't shy away from new foods: The markets in France were the perfect place to explore with Lian in tow. Our daughter is a generally a good eater, but especially enjoyed (not surprisingly) the croissants and baguettes. My husband got his fill of cheese and meats while I was all about the fresh fruit. Lian also surprised us by trying new things. She was a big fan of fried sardines. Who knew? Consider getting childcare: We hired babysitters in each destination for some non-kid time. We found them via our hotel or searched for reputable services online. We always had the sitter come early so we could make sure we were all comfortable with each other before heading out. Travel like a local (family): Both France and Switzerland are very kid—and pregnancy—friendly countries. We found restaurants incredibly accommodating. In a one quintessential Parisian bistro, the waiter brought Lian crayons and a drawing book, and her meal was complimentary. In Provence, we decided to bring her to lunch at Michelin-starred restaurant Christian Etienne, which to our surprise, had a kid’s menu. They even brought her a mini soup and dessert from our tasting menu after she expressed interest. Sipping tea at Ladurée Paris Champs Elysees on Mother's Day. While this upscale spot might seem an intimidating choice with children, they are well prepared with crayons and coloring books. In France, they were much more liberal when it comes to drinking wine while pregnant. If I had a small two oz pour, I didn’t get any weird looks, and on more than one occasion our server encouraged me to drink more, noting it was good for the baby! (For the record, I stuck to my doctor's orders on that one.) On the flip side, I was surprised to see that the French were in tune with my concerns about eating unpasteurized cheeses. When I asked a cheese monger in Provence’s Saint Rémy Market if he had pasteurized cheese, he pointed out symbols that indicate whether or not they were pasteurized. It was a great tip—and I managed to enjoy some delicious fromage after all. Hi kids! Traveling to France? Here are five fun facts about the country. Have more questions about the Levi’s France and Switzerland itinerary? Drop me a line below.